A downtown woman faces challenges navigating the city – and the laws – with her service dog in tow. This article originally appeared in Our Town Downtown on July 17 and another version appeared in Our Town on the same date. Wargas rides the L towards 8th Avenue standing up, his tall frame compensating for the sway of the train. Other passengers stare and say to his owner, Cissy Stamm, “that’s a big horse.” Some snap photos with their cellphones while others want to pet him. Wargas is an enormous Anatolian Shepherd; white, tall and slender with a long tail. He’s a service dog for Stamm, 68, who suffers from Post Traumatic Stress Disorder as a result of sexual abuse she endured as a child. She was diagnosed with PTSD 23 years ago, and Wargas helps her manage her disability. “Having a disability and having to navigate the world is not easy,” says Stamm. She doesn’t take stairs well and must wait for an elevator at Union Square – the station closest to where she lives – to get on and off the subway. Cissy Stamm with Wargas on a city bus. Before retiring, Stamm was in advertising where she met her husband, Woody, who takes Wargas for walks where he gets to be a dog like any other, sniffing bushes and greeting other dogs with his great, white muzzle. Wargas is trained to mitigate disability, says Stamm. Her PTSD manifests itself as hypervigilance, flashbacks and panic attacks and usually surfaces by way of a trigger; tight spaces, crowds, physical contact. The attacks are called “dissociative states,” she says, where she doesn’t know where she is. Wargas acts as a reverse trigger to these states, bringing her back to the here and now with a swipe of the leg or a nuzzle. He also stands in front of her to give her space and serves as a buffer when moving through crowds. Boarding a train recently, Stamm asks a mother and her son if they’re okay being in proximity to Wargas. The mother says they’re fine. Exiting the train, Stamm waits for two groups of people to use the elevator before it’s her turn. At the turnstiles exiting the subway she moves through, then turns around and loops the leash around the spindles so it doesn’t get caught, and waits for Wargas to move through (he has to duck). 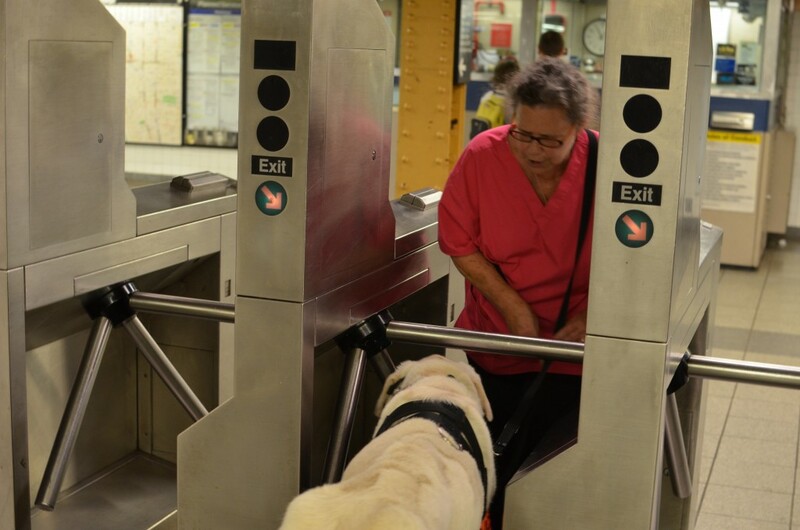 Stamm said that public access for service animals – subways, buses, restaurants – is getting better but a lot of work still needs to be done. “I rarely have problems,” says Stamm, of using the subway. Restaurants are a different matter. It’s tense in a mostly empty Chinese buffet near 8th Avenue and 14th Street, where the workers are clearly not comfortable with a dog on the premises, let alone one of Wargas’s size. An employee approaches Stamm with uncertainty, and in halting English, says that dogs are not allowed. Stamm informs her that Wargas is a service dog and is allowed, and the employee repeats her earlier claim that dogs are not allowed. Stamm puts food on her plate anyway and moves to the cash register. A different employee tells her that she cannot eat here with a dog, and that she doesn’t want to get in trouble with her boss. “Some people say even service dogs are allowed now, I don’t know exactly, but usually no,” the cashier tells Stamm and the other employee. “I don’t think you can stay,” she says to Stamm. Stamm asks for a business card and the cashier says she doesn’t have one and asks her what the law is. Stamm tells her that Wargas is a service dog and under the law, is allowed to be in the restaurant. After some haggling the employees relent. Stamm and Wargas sit down to eat. Stamm navigating a subway turnstile with Wargas. Situations in which Stamm is denied service exacerbate her potential to suffer flashbacks and panic attacks, a circumstance that many who have service animals for PTSD have to deal with. She says a friend of hers who was suffering a panic attack had to leave a store and lay down on a sidewalk with her dog on top of her to recover. Another friend was denied service at a welfare office and suffered a heart attack, which he survived. The encounter illustrates a point Stamm made earlier in the day, that those who work in restaurants don’t always receive compliance training for the Americans with Disabilities Act, especially those who don’t speak English well. Under the ADA, service animals are defined as dogs “that are individually trained to do work or perform tasks for people with disabilities.” This can include guiding people who are blind, alerting people who are deaf, pulling a wheelchair, alerting and protecting a person who is having a seizure, reminding a person with mental illness to take prescribed medications or calming a person with PTSD during an anxiety attack. The guiding benchmark of the law is that a service animal’s work must be directly related to the user’s disability. Stamm has fought public access battles – like the relatively mild one at the Chinese buffet – since 1997, when she first began using a service dog. She has successfully sued the transit police and has a lawsuit currently pending against the city and the bus authority, based on 55 access violations she’s dealt with. She believes even though the latest suit hasn’t yet come to a resolution, its existence may have changed the city’s public transit access policies for people with disabilities. “Public access has a long way to go,” says Stamm, with the biggest areas in need of improvement being restaurants and public transit. She does say that public access has gotten better over the years, and predicts it will improve further with new technologies and the increase in military veterans returning home with disabilities. She fights back in other ways too, co-founding NY Area Service Dogs, an organization that provides education for people who need service dogs and businesses looking for information on service animal guidelines. The organization also advocates on behalf of people with disabilities or who need emotional support dogs. Stamm says that when she’s denied service by a business she lodges a complaint with the authority whose jurisdiction the business is in. Action is not usually taken unless the authority levies a fine against that business. When she’s denied service on a bus or subway, she lodges a complaint with the city’s Human Rights Commission. Another obstacle for those who use service dogs are the particulars of the Americans with Disabilities Act itself. For instance, a 2011 update to the ADA clarifies that emotional support dogs are not classified as service animals because they don’t have the same level of specialized training that a service dog must have. This graduated proficiency training acclimates service dogs to crowds and teaches them to abstain from typical dog behaviors; sniffing food, barking, hyperactivity and socialization. These differences, along with other laws like the Fair Housing Act and the Air Carrier Access Act that can come into play, are cause for confusion for everyone involved in matters of public access. The differing perceptions that business owners, their employees and public transit workers have of these laws all combine to create a public access game of roulette for people with disabilities, especially in urban centers like New York City. 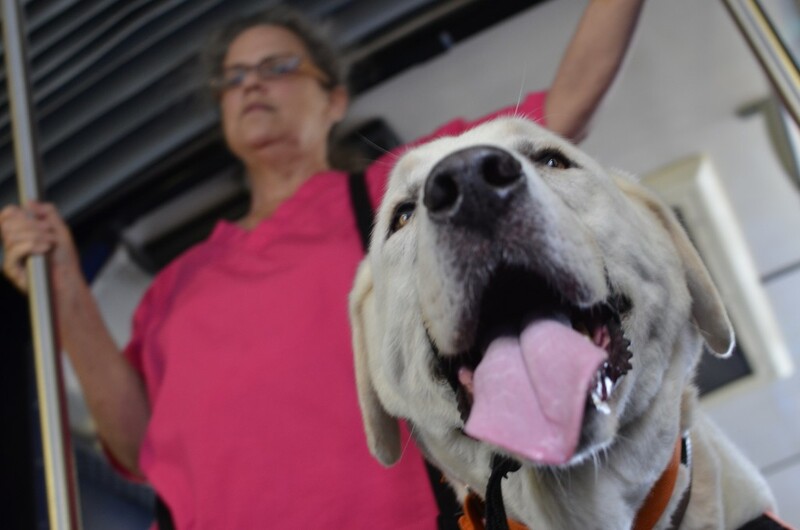 “The public needs to be educated on what an emotional support dog is, what a service dog is, what a therapy dog is, and what the public’s protections are with regards to having an animal that’s out of control or is a nuisance in any way,” says Stamm. As an example, Stamm says an owner whose service dog is barking or being disruptive or threatening can be asked to leave under the law. Some people assume service dogs must be tolerated no matter what, Stamm says, but that’s not the case. Later in the day, on a NYC bus, Stamm is holding onto a pole and Wargas is doing his improbable balancing act. People board the bus like they would any other, and then pause when they see the two standing in the aisle. Most are delighted and intrigued to be traveling with a big dog, much like the passengers in the subway before lunch. One passenger offers Stamm some water for Wargas and another strikes up a conversation with her about therapy dogs. It’s an everyday encounter on NYC public transit, where New Yorkers spend so much of their time in close proximity to one another. However, it only takes one of these encounters to go wrong for Stamm to know that her disability still poses a problem for some, 23 years after the Americans with Disabilities Act became law. Excellent article and very timely. I never realized how uneducated the public was about service dogs, and how difficult that must make it for those who need them.